Cheese loaded Black Chickpeas and Soybean Kebabs with a crown of McCain Smiles and Whole Wheat Red Velvet Cupcake topped with Whipping Cream! : A dose of smile to a bunch of underprivileged children! It is truly said by McCain that “Smiles are doubled, when shared. And the most priceless thing is to make your loved ones smile”. I used to make my days of Durga Puja special with a special treat on Navami for the children of labourers worked nearby my place in Gurgaon till last year and was really unhappy this year as I thought I may not be able to found a group of smiling face in the nearby locality of my Kolkata residence. But as they say “when there is a will, there is a way”… Yes this is what happened to me on the day of Saptami when I was in our Durga Puja Pandal with a little sour heart. 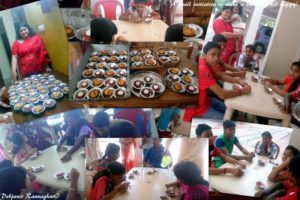 I heard, this year around 20 underprivileged children residing at a nearby NGO are coming to our Puja on the day of Asthami (8th day of Durga Puja) to celebrate Durga Puja with us and our Puja committee was planning for a healthy snack for them!! It took me hardly 30 seconds to discuss with them that “I am going to prepare snacks for those 20 children”! Our committee members were a bit confused and worried since I had only one night to prepare the food and Asthami puja will also be there. They suggested me to purchase food and serve but I was confident that I am going to do it by any cost! And then started my small journey of pleasure to make a bunch of children happy with my little attempt! I returned to my apartment at around 5 p.m. from the pandal to make necessary arrangement for making Snacks for around 20 Children! One thing was strictly in my mind that my platter has to be a healthy and energetic one with no compromise to the look and taste. I was thinking for something that will give them a flavour of well-presented food which they may wished for but not able to afford. I started looking at my kitchen store and on the first go picked two things: Whole Wheat Flour and Black Chickpeas! I have decided to make something with the Black Chickpeas and Whole Wheat Flour since these two items are used in making Chole Poori that is served either in Asthami or Navami to the little Kanjakis and that is what I used serve to the underprivileged children while I was in Gurgaon but I have decided to make something different with these two ingredients. 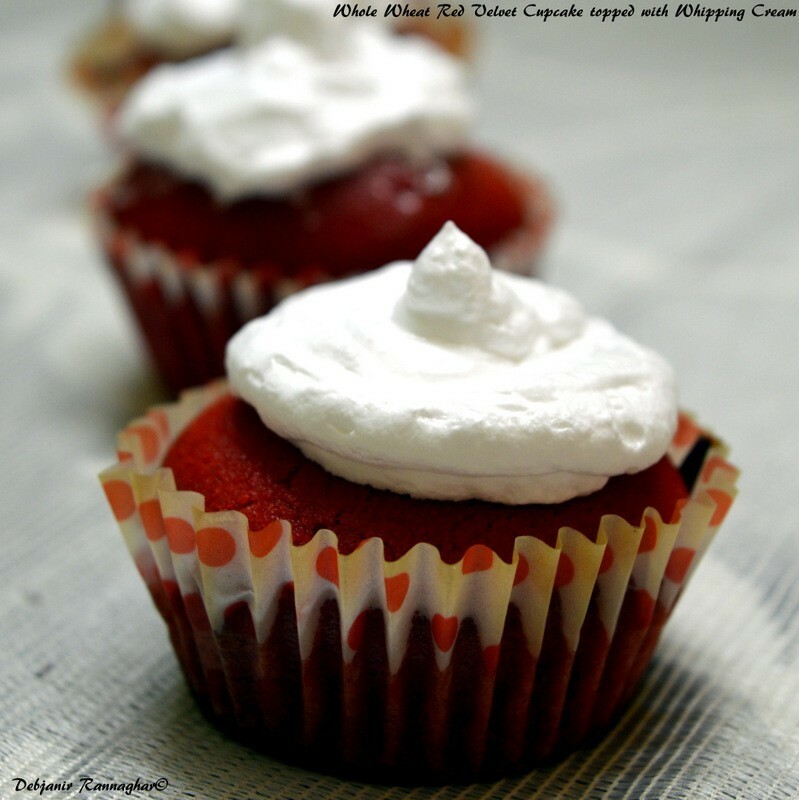 I finally decided to make Black Chickpeas Kebab and Whole Wheat Red Velvet Cupcake! Cupcake was decided on the first go but I was not satisfied with the idea of a simple Kebab and decided to make Kebabs tastier, more tempting and more energetic and ended on adding Soybean to my Kebabs and to fill those with a mixture of Cottage Cheese and Mozzarella Cheese but still not happy with the entire idea of topping. My cupcakes were decided to be topped with whipping cream and suddenly I picked a packet of McCain Smiles which are my daughter’s favourite too and decided to make those as a crown to my Kebabs! 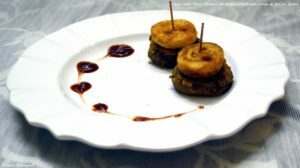 This idea of adding McCain Smiles to my Kebab finally given me the idea of writing something for the “Let’s Put a Smile on That Face” contest organized by McCain Foods (India) in collaboration with Indiblogger! Next few hours (till morning 7 a.m.) was spend with the entire process of making “Cheese loaded Black Chickpeas and Soybean Kebabs with a crown of McCain Smiles and Whole Wheat Red Velvet Cupcakes” for 20 children (and 5 plates extra) plus a plate for my little angel Pasta who did provided me the energy to prepare the platter. Cooking is always been my passion and I found peace in cooking but to cook for the children is always a matter of tension to me. It is really too difficult to make children happy with cooking because they always speak their heart! I started with soaking Black Chickpeas in water for 8 hours and by that time I made the arrangement for Cupcake batter. I have used whole wheat flour as one of the main ingredient, I have made my cupcakes with whole wheat flour to make those healthy. I have not added Butter in cupcake instead used soybean oil for making the batter. 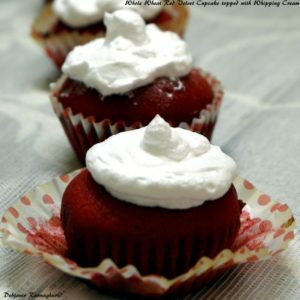 Cupcakes were topped with whipping cream; I didn’t have much choice available for cake topping given it was sudden decision to make the platters for the underprivileged children. Coming to the Kebabs, as I mentioned that the outer crust of the Kebab was made up of boiled black chickpeas and I have added a powder of Soybean to make those more nutritious and Kebabs were filled with a mixture of Paneer and Mozzarella cheese and last but not the least topped with McCain Smiles! 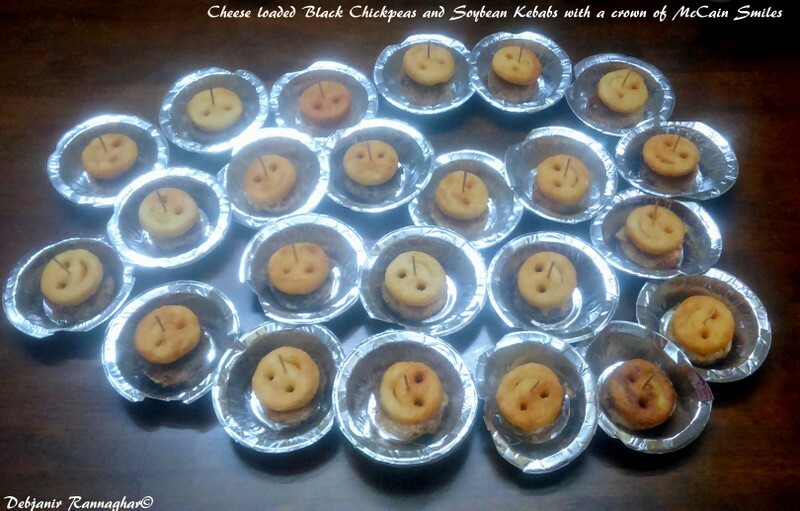 Cheese loaded Black Chickpeas and Soybean Kebab with a crown of McCain Smile is a perfect dose of energy with a perfect look. 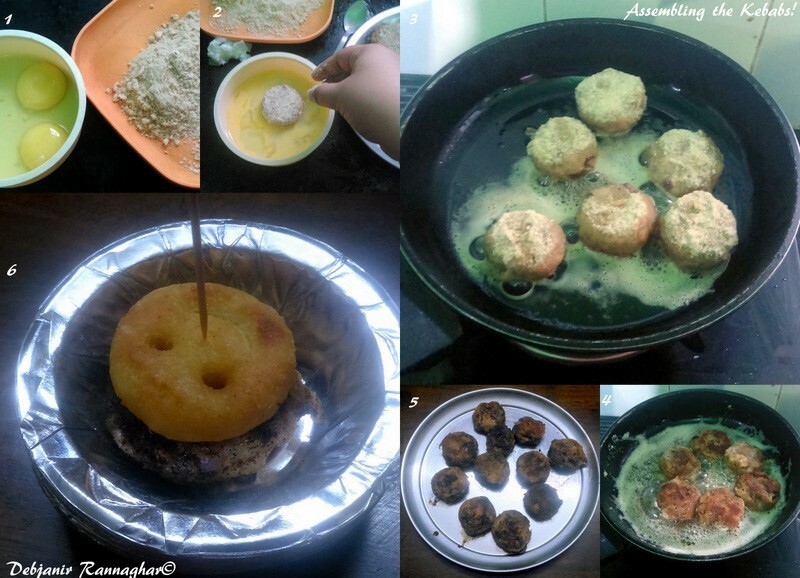 I have done with the process of making the cupcakes and Kebabs by night and just fried both Kebab and smiles in the morning and assembled those and Cupcakes were topped with the whipping cream in the morning too. Children were served at around 10 a.m. in the morning and too see them having my platters was a moment of pleasure to me! It has given me immense pleasure to serve them with my very little effort! While asking they told me how much they are happy with my food and moreover having smiles on the top of a healthy Kebab! 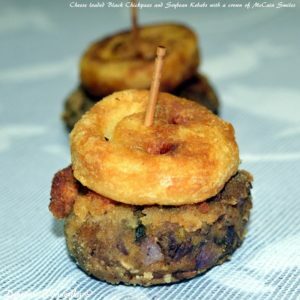 I am sharing the recipe below for both Cheese loaded Black Chickpeas and Soybean Kebabs with a crown of McCain Smiles and Whole Wheat Red Velvet Cupcake. For the ease of the readers recipe is given for making 9 pieces of the each item. Bengal Gram Flour/ Besan : 3 Tbsp. Dry Mango Powder: 1 Tsp. Soak Black Chickpeas with the skin on along with 1 Tsp. Salt in water for around 8 hours. Take soaked Black Chickpeas along with 1 Tsp. of salt and 4 Cup of Water in a pressure cooker and start cooking with the weight on in high flame. After one whistle slower the flame and let it cooked for 20-25 minutes. Switch the flame off and wait till the cooker release the pressure and then open the lid. Strain Black Chickpeas from the water and reserve 1 cup of Black Chickpeas Stock for future use. Make powder of Soybeans using a grinder. Now using a mixer grinder make a paste of the boiled chickpeas along with garlic cloves and don’t add extra water while making the paste. 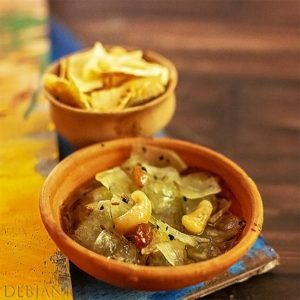 Chop Onions and green Chilies into small pieces. 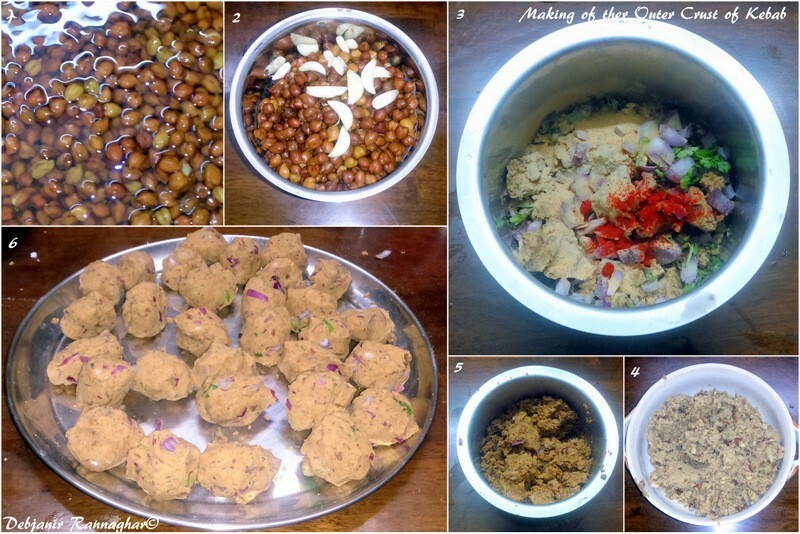 Now take the Black Chickpeas paste in a bowl and add Soybean Powder, Besan, chopped Onion, chopped Green Chilies, ½ of the Kashmiri Red chili powder, Dry Mango powder, Chat masala and using your hand mix properly. Check and add little salt if required. Make small balls (3” size) out of the mixture. Grate both Paneer and Mozzarella Cheese using a greater. Mix little salt and Kashmiri Red Chili Powder to the Paneer and Cheese Mix and make small balls of the Cheese mix (1” size). 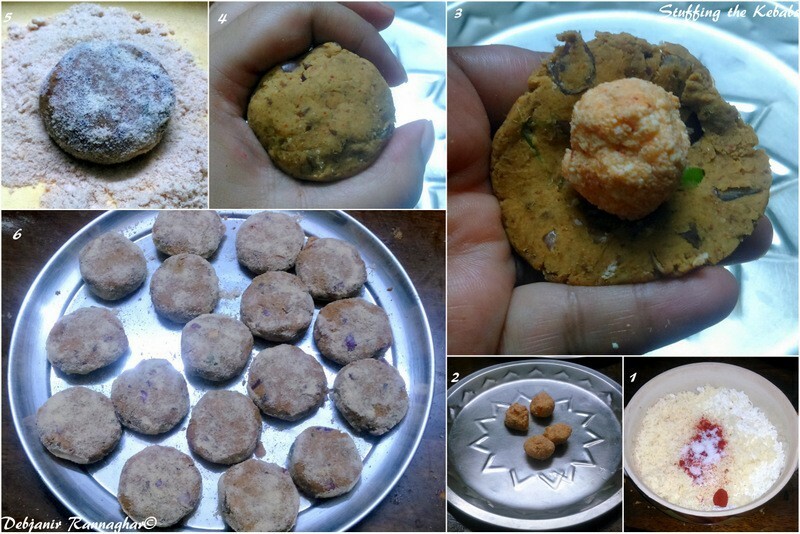 Now take one Chickpeas ball and flatted it on your palm and put a Cheese ball in the middle and seal the chickpeas ball properly and give each stuffed ball a shape of Kebab (as shown in the picture. Coat each Kebab with bread Crumb and place in a plate. Refrigerate Kebabs for 3-4 hours. I did it overnight. Heat Oil in a deep wok. 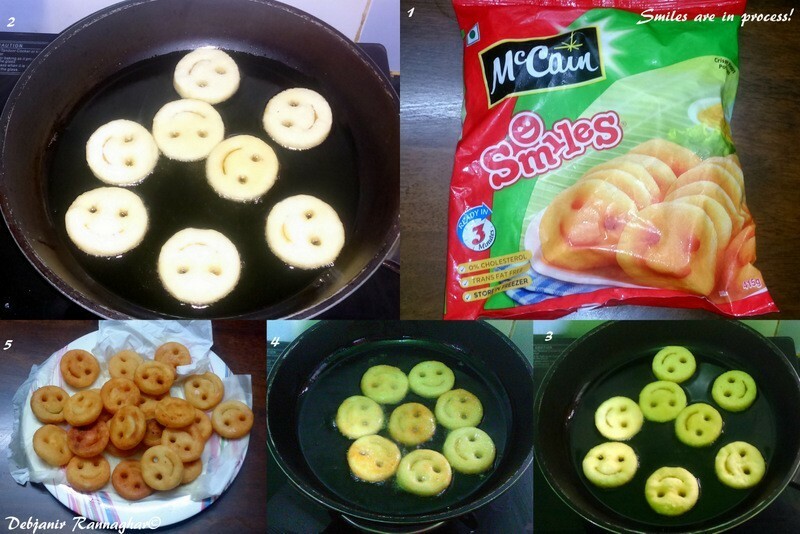 Now fry McCain Smiles for 3 minutes (both side) until those turn golden in colour. 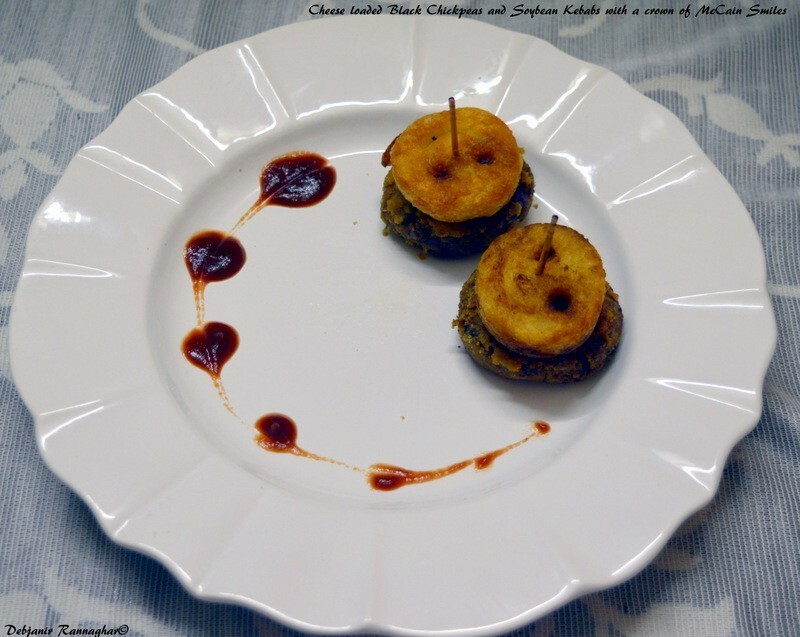 Beat Eggs and be ready with the remaining Bread Crumbs to give final touch to the Kebabs. Coat each Kebab in Egg first and in the breadcrumbs and then fry in medium flame until Kebabs turn golden brown from each side. Place one Kebab in a plate and top it with a McCain Smily and insert a toothpick in the middle to seal both. This small initiative to feed underprivileged children with a platter loaded with health and happiness made my day and I found my Pooja gift in their smile. I am sending this post of mine on “Cheese loaded Black Chickpeas and Soybean Kebabs with a crown of McCain Smiles and Whole Wheat Red Velvet Cupcake topped with Whipping Cream” to “Let’s Put a Smile on That Face” contest organized by McCain Foods (India) (click on the link for further details). 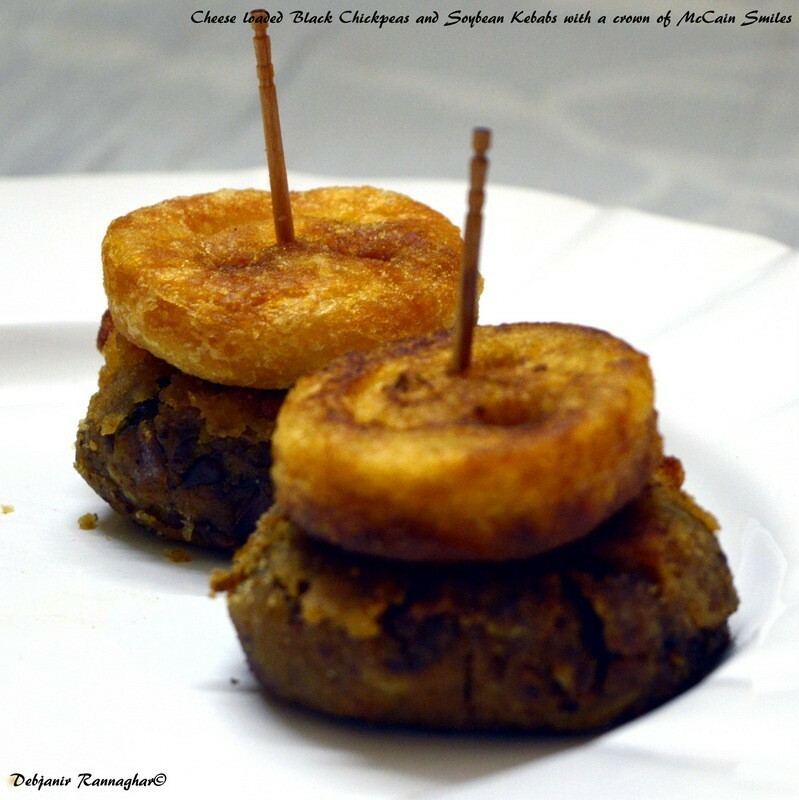 « Grilled Katla with Indian Spices!